Eat, Run, Read: Giveaway Winner! And the winner is...dun dun dun...lucky number 5! That's Amy from Welcome to Boston! Congratulations Amy and thanks for donating! Shoot me an email (molliezapata@yahoo.com) and I'll get you some pillow cookies ASAP! Thanks to everyone who donated, tweeted, blogged, and entered my giveaway! Want to hear about the impact you made? This initiative has raised an astounding $6,500 in one month due to your efforts! So far, over 1200 Nigeriens now have over One Month's Food Security as a direct result of the collective action of 123 donations. Everyone working behind the scenes at Niger Food Relief expresses the deepest acknowledgement of appreciation to each of you who has supported this initiative through nigerfoodrelief.org. This week, the Nomad Foundation commenced distribution of Emergency Food Aid with money raised by our collective efforts. According to the organization's founder, Leslie Clark, "The Nomad Foundation is covering the costs of the distribution, so your money [the money raised by Niger Food Relief] is going entirely to millet." 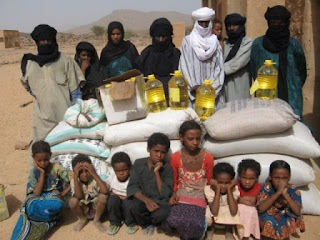 So far, $4,210 of money raised through Niger Food Relief has been spent purchasing millet. 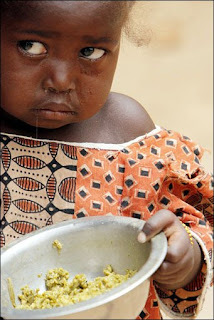 This means that Nigeriens can look forward to receiving the remaining $2,300 of your contributions in the coming days. We have already made such a significant impact with only two-thirds of our raised funds. These remaining funds will continue to be dispersed this week and in the coming weeks in the most effective and targeted way. Our fundraising efforts will continue until October 1st, 2010 so even if you didn't enter the giveaway, it's not too late to donate! $10 Feeds a Family of 8 for One Week!